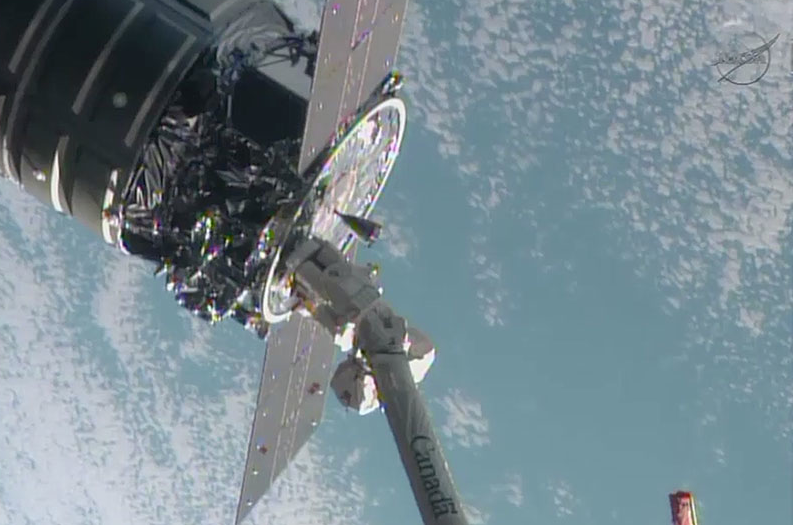 Capture of the Cygnus spacecraft by the International Space Station remote arm occurred at 7:00 am ET today. 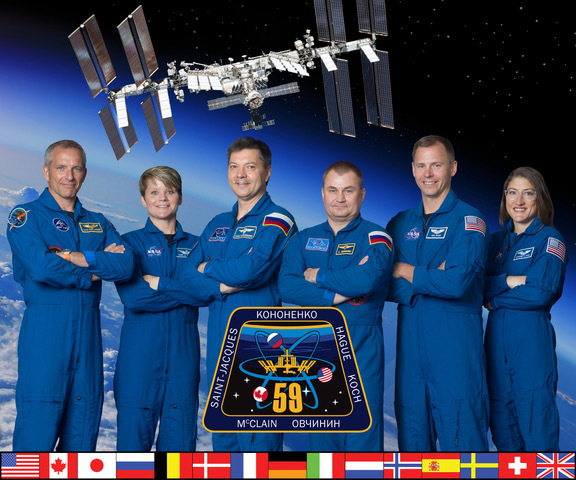 The spacecraft is set to berth with Station at 9:15 am ET today. A NASA press conference will take place at 1 pm ET. You can watch all of it live via the NASA TV portal below. Capture and berthing of the Cygnus vehicle at the International Space Station was delayed 1 week after its Wednesday September 18 launch due to a software glitch, and then a traffic jam at Station. Soyuz 36S, carrying Expedition 37/38 crew members Michael Hopkins (USA) Oleg Kotov (Russia), and Sergey Ryazanskiy (Russia) launched and docked with Station on September 25. Aboard Cygnus are the 7 Student Spaceflight Experiments Program (SSEP) microgravity experiments comprising the SSEP Falcon I payload (see the September 17, 2013 Blog Post for details of each experiment.) Each experiment has both an on-orbit mini-lab and at least one identical mini-lab on the ground to conduct a ‘ground truth’. On return to Earth of the flight mini-lab, each student research team will harvest both flight and ground mini-labs, and conduct a comparison of both to assess the role of gravity in the physical, chemical or biological system under study. Aboard Station, the system operated as if gravity was ‘turned off’ due to the weightless environment. The hatch to Cygnus is scheduled to be opened at 5:55 am ET Monday, September 30. Falcon 1 is set to be moved from Cygnus to Station on Monday, and each student flight team is now standing by to begin ground truth operations, which need to mirror on-orbit operations conducted by Station Crew according to the protocol defined by the student research team. While there are 5 pre-defined Crew Interaction Days with the Falcon I payload during its time aboard ISS, the time of day for interactions is dependent on crew schedule and is not known in advance. Therefore it is essential that the time and nature of the interactions on Station are reported back to the student flight teams so they can mirror operations on the ground. NanoRacks is standing by to relay details of all crew interactions with the experiments to NCESSE for posting on the Falcon 1 Experiment Activities Log. The crew will inform Marshall Space Flight Center as activities occur, that information will then be relayed to Johnson Space Center, and then on to NanoRacks. The Log includes expected interactions for each experiment on the 5 Crew Interaction Days, and will be regularly updated to provide a formal record of when each interaction actually occurred. You can follow along with the flight of Falcon 1 by bookmarking the Experiment Activities Log. Soyuz 35S, which was already docked at Station before the arrival of Soyuz 36S on September 25, is the vehicle that will transport the Falcon I payload back to Earth, landing in Kazakhstan on November 11, 2013. The Mission 3 countdown clock in the right column is now counting down to return to Earth. After landing in Kazakhstan, Falcon I will be air-freighted back to Johnson Space Center, for payload de-integration, and overnight shipping of the mini-labs to the student flight teams for harvesting and analysis. The Soyuz 36S vehicle that just arrived at Station is currently scheduled to return to Earth both the SSEP Mission 3 Falcon II payload of 12 experiments and the SSEP Mission 4 Orion payload of 11 experiments. Both these two payloads are currently scheduled for launch aboard Orb-1 – the first operational flight of the Cygnus vehicle – from the Mid-Atlantic Regional Spaceport (MARS), Wallops Island, Virginia, in December 2013. Program Note: SSEP is truly a historic STEM education program. The first two SSEP payloads – Eagle with 16 experiments and Intrepid with 11 experiments – flew on the final two flights of the U.S. Space Shuttle Program – STS-134: the final flight of Shuttle Endeavour, and STS-135: the final flight of Shuttle Atlantis. The SSEP Aquarius payload of 15 experiments was the only research payload on the first flight of SpaceX Dragon to berth with Station – the first commercial vehicle to berth with ISS. The SSEP Antares payload of 11 experiments and the Aquarius II payload of 12 experiments were on SpaceX-1, the first operational flight of SpaceX Dragon. The SSEP Falcon I payload of 7 experiments, together with 4 other NanoRacks experiments, comprise the only research payload on Orb-D1, the first flight of Cygnus to berth with Station. That is occurring at 9:15 am ET today. SSEP is now fully a part of the history of human spaceflight as the U.S. Space Program transitions from the end of the Shuttle era to the commercial era servicing low Earth orbit with first cargo then crew. All 28,600 students that have formally taken part in SSEP since program inception in June 2010 should take pride in their part in this historic endeavor. Hopefully the nation is watching this program, which was designed as a model for U.S. national STEM education that provides highly leveraged immersion in authentic research and is rooted in the Next Generation Science Standards. Good luck to all the student flight teams for Falcon I. The 23 student flight teams for Falcon II (SSEP Mission 3b to ISS) and Orion (SSEP Mission 4 to ISS) should consider this a dress rehearsal for their flight operations later this year. To all 7,000 students, currently engaged in Mission 5 to ISS – get inspired. Your flight experiment proposals are due in just a few weeks. Finally, the National Center for Earth and Space Science Education and the Clarke Institute for Space Education are days away from announcing Mission 6 to ISS for communities across the U.S. and internationally. Mission 6 will have an experiment deign and proposal phase in Winter/Spring 2014, and launch of flight experiments to ISS in Fall 2014. Is your community ready to be part of the adventure? Contact us.